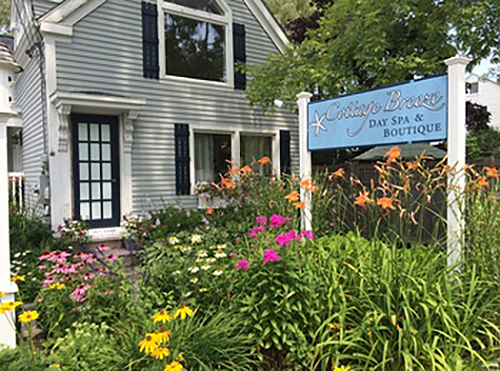 Cottage Breeze Day Spa & Boutique is located in the heart of Lower Village, Kennebunk. We are within walking distance to Dock Square, Kennebunkport and offer ample complimentary parking. The spa opened in June, 2007 with a goal of providing our guests with the best quality of health, beauty and wellness services. Our calming and soothing environment is a wonderful oasis for those looking to relax, renew or reboot, even just for an hour or two. Each service is designed to address your individual needs….our trained therapists strive to make every spa experience memorable and renewing. Our aromatherapy offerings give you the ultimate in customization and relaxation, whether your goal is to renew, relax, unwind or completely de-stress. We have carefully selected some of the best and most therapeutic treatment products available. For facials, we use Naturopathica, Dermalogica and Intraceuticals. Your skincare therapist will work with you to address your facial needs. For massage & body treatments, our professional products include Aromatherapy Associates, Naturopathica, Hope Gillerman Organics and Biotone. Our spa boutique offers a very abundant array of some of the best body and skincare products. We have a great selection of gifts to help pamper yourself or a loved one…skin care, makeup, candles, bath & body products, diffusers, fragrances, jewelry and much more. Cottage Breeze Day Spa & Boutique offers both instant gift certificates as well as gift cards. Once purchased, our instant gift certificates can be either printed or emailed. Our gift cards can be purchased at the spa, over the phone or via the link on our website. Please visit our Gift Card page for more information or to purchase.